So, there is this guy. He’s a ballplayer. Not a particularly great or notable one, but still a ballplayer. He’s so desperate to keep playing that after college he moves to the land of his ancestors: Italy. He plays baseball there, is pretty good. Falls in love with a local. Marries her, they spend their days split between Massachusetts and Italy. They have a son. That son follows in his father’s footsteps, growing up and playing baseball on two continents. Trials and tribulations- of his own making and of fate’s- seem to keep him from reaching his true potential, and after college he, like his father, finds his baseball career seemingly at an end. Except instead of across the sea, the son stays near home: Independent Ball. The last hope or only shot of the truly baseball-desperate. Pitiful salaries, long bus rides, no fame… only dreams. He spends seven years there, occasionally leaving to represent Italia, the land where he grew up and where his mother was born. Most would quit, or at least consider other options. This guy doesn’t. He keeps going, and finally, when he’s in his late 20s, he’s doing so well he cannot be ignored. A major league organization signs him, and at age 28 he begins his first Minor League season, nearly four years older than his average teammate. And he is a revelation, as he becomes one of the best hitters on a team with some of the farm system’s best prospects. The next year, in AAA, he does it again and is named MVP in the league, becoming a fan favorite in a Upstate New York town in a season that began with him pacing his ancestral home to it’s best showing in the history of the World Baseball Classic. Except…. it’s not the end. He was called up. He doesn’t do all that well in his first stint in the show, but it’s a dream that he had scraped and clawed for so long, finally achieved. That offseason, with no guarantees of a roster spot the next season, he is offered a big money deal from a team in Korea. He could make more money than he ever has. He refuses, as it would mean shutting the door, perhaps permanently, on his Major League dreams. At first, it seems he made the right decision. He gets a roster spot and starts the year on a historic tear, breaking the team RBI record for April that had been set by a legendary man. He hits a home run in front of his parents as they are interviewed on television, a birthday gift to his mother. But then… it falls apart. April proves the exception, and in late May he is sent down to AAA… even as the program-covers that greet fans at the Major League ballpark bear his face. He goes back and forth like a yo-yo, but ultimately he spends more time in AAA than he does in the show. For some, this would be the end. Those gasps of major league greatness would be all there would be. Not for him. The next year, after a good start in AAA, he goes to a third country: Canada. He never recaptures that April, and he doesn’t play every game… but he doesn’t need to. He’s another bat in a lineup of big bats. He has a career year, and he is a mainstay in the starting lineup during the postseason, where he hits two home runs. It seems, perhaps, that he has finally arrived. But then, the next season, he starts on a slump. Some wonder if he might again get sent down. And then, late in April, the slump becomes the least of his worries. He’s suspended for 80 games for using a Performance Enhancing Drug. An old one. East German. And suddenly, a story that seemed too extraordinary for Hollywood becomes one that is too real for Hollywood. It’s the story of Chris Colabello, son of Lou Colabello. His has been a story of near-biblical persistence and long odds. A story that brought him from Italy and Massachusetts, through New Britain and Rochester and Minneapolis and Buffalo, and finally to Toronto. That he suddenly is caught using a Cold War-era PED in some ways casts a shroud of doubt on all of it. There is, of course, no way of knowing if that is the case. It seems unlikely that he would have been using such a obvious and classic steroid for so long without getting caught. After all, this is a player who would have been subject not just to the MLB tests of the past few years, but also tests in the minors and in overseas competitions. Perhaps he was using something else this whole time. Perhaps it was just a mistake. It could have been a accident or (for the more conspiracy-prone) an act of malice by a trainer or pharmacist. Or maybe, having finally truly tasted the highest heights of his profession, Chris Colabello thought he needed to do anything and everything he could to stay there, or perhaps even go higher. And perhaps, like Icarus, he got too close to the sun. I don’t know. Nobody, aside perhaps from Colabello himself, knows. And perhaps that is why his suspension is so unsettling to myself and many other baseball fans, particularly fans of the Twins and Blue Jays. An icon of hard work and perseverance, suddenly found to have been taking the easy way out. Over a decade of work, seemingly thrown away. What this means… I’m not sure I’ll ever know. I’m not sure if we’ll ever know. Perhaps it just means that Chris Colabello, like all of us… is human. Over at Hall of Very Good, the latest Wisdom and Links looks at the upcoming Anti-Toronto Conspiracy. Check it out. In 30 Teams, 30 Posts, I write a post about every MLB team in some way in the lead-up to the beginning of the 2015 season. Previous installments can be found here. Today, the Blue Jays. It was 1:05, and I turned on the TV to see that, finally, gloriously, spring training baseball has begun. MLB Network had Blue Jays vs. Pirates. 1) They essentially had a opening-day starting lineup to start off (with the exception of the starting pitcher, Aaron Sanchez), which is nice. Some teams will almost never have a opening-day lineup during Spring Training until the very end, but the Blue Jays have gotten down to business quick. 2) Russell Martin was starting his first pseudo-game in a Blue Jays uniform, and it was against his former team. Funny how that always happens. He made a nice defensive play in the first inning throwing out Sean Rodriguez on a full-swing bunt from his knees, although Justin Smoak definitely had to reach a bit to get the ball. 3) Aaron Sanchez gave up a 3-run, 2-out HR to Pedro Alvarez. Whoops. That probably wasn’t part of his plan. Then again, it should have ended the batter before, but Josh Donaldson botched picking up a ball. And that is why they have Spring Training, folks! Jose Bautista loses his first hit to shift this year, liner up middle turns into 4-3 in three-up, three-down B1 for Casey Sadler. Yeah, that happened. And it will happen again. Well, the lost hits due to shift. 5) Technical difficulties hit MLB Network at like 1:23. It gets all pixelly and stuff. This is an issue. 6) At 1:25, it got better. Praise the cable gods! 7) Aaron Sanchez has Pat Hentgen’s number. 8) Aaron Sanchez, who had a 1.09 ERA in 24 relief appearances last year, is knocked out in the second inning, down 5-0. Maybe he’s not made to be a starter, or maybe IT’S JUST THE FIRST SPRING TRAINING GAME AND WE SHOULDN’T JUMP TO CONCLUSIONS! 9) Through two innings, the Blue Jays are hitless, which totally means they won’t get a single hit all this season. And we thought the Phillies would be bad. 10) Jung-Ho Kang hits his first professional North American home run for the Pirates, making it 6-0. It was off Marco Estrada. The Blue Jays have yet to throw a scoreless inning this pre-season. This means absolutely nothing. 11) Every time Kevin Pillar comes up, I think he’s Kevin Millar. I had a similar problem with Ryan Roberts and Brian Roberts. Oh, and as I typed that, Kevin Pillar hit a 2-run home run, so Toronto won’t get shut-out on the preseason. Good for him. 12) If Dalton Pompey (said like “Pompeii”) doesn’t have that song by Bastille play every time he comes to the plate, something is wrong. He makes a nice steal after reaching base on a single. 13) I miss the end of the third ending making myself a late lunch. The Blue Jays make it 6-3. I wasn’t watching and thus cannot comment. Apologies. 14) Realizing I have other stuff I need to do, I decide I will cap this at 15. 15) Dalton Pompey makes a nice sliding catch in left field in the 5th inning. Later in that same inning, he loses a ball in the sun or something and it falls in for a RBI double. Baseball is a cruel mistress. And thus ends my observations of the Toronto Blue Jays in their first Spring Training game. The Blue Jays will play exhibition games in Montreal next year. Ever wonder what the most distant seat in baseball is? 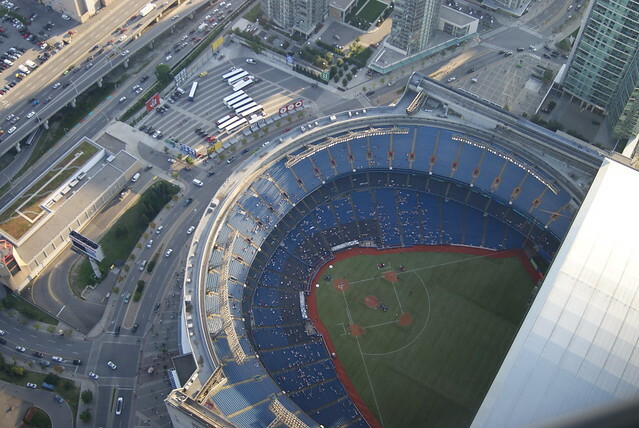 This photo of Rogers Centre taken from the CN Tower is used under a creative commons license and was taken by Chris Angle.